Ireland rallied to come from behind against a strong, fit Great Britain team in a thrilling semi final match that went down to the wire. 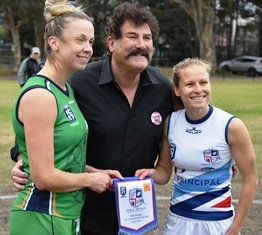 The momentum was with Great Britain at three quarter time but the Irish girls came out swinging in the fourth, kicking two goals and managing to keep Great Britain scoreless. Both teams began the game in a defensive lineup by starting with an extra player behind the ball. The beginning of the match looked like Ireland were the team to beat, with an excellent start from #12 Carol Breen, who’s lighting pace was a handful for the Swans to deal with. Great Britain stayed strong though, and with #6 Caroline Sellar taking a great mark and giving a clever pass off to her teammate to score the first goal, it was going to be a close game. Ireland were unable to score a goal in the first quarter, which saw them trailing by 6 points going into the quarter time break. The second quarter was once again evenly matched, with no team taking complete control of the game, causing the ball going back and forth in the midfield. Most of the opportunities that were given to both teams going forward were through free kicks, but neither team were looking to switch the play and move the ball around to get forward, instead were just kicking into congested areas hoping for a mark or free kick in their favour. Irelands #36 Christine McCutcheon sadly went down injured after beginning to have an impact on the game with her strong marking abilities. The team managed to push on and #29 Deborah Geraghty scored and excellent goal out of the pack to put the girls 1 point ahead leading into half time. Early in the third quarter say a tough tackle laid by Irelands #6 Emma Kelly set the tone for the second half. Unfortunately, this saw the Great Britain player not get up because of a sustained injury. Emma immediately signaled to the bench for help and stayed with her injured opponent until trainers arrived to help. It was great to see an excellent level of sportsmanship shown by a player, in such a close and important semi final. Great Britain’s # 14 Rania Ramadan capitalized on a poor turnover from the Irish backline, and put the Swans ahead by a goal. 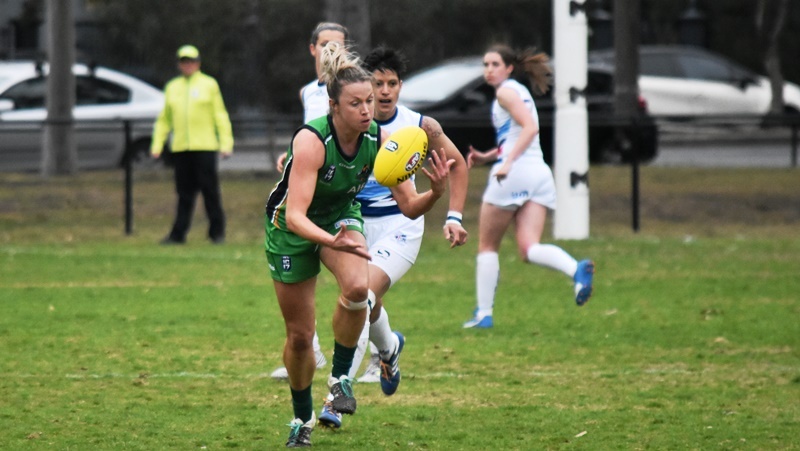 If it wasn’t for the tough backline performance from the Banshees #22 Colleen Quinn, her team would have been in trouble, with the momentum with the Swans. Ireland came into the last quarter trailing by a goal and but with a missed opportunity early on from Great Britain’s #4 Alexandra Peill, the Banshees were still in touch. Irelands ball movement had drastically improved from the previous quarter and it felt like the momentum was with them. Great Britain’s #14 Rania Ramadan was doing all she could to counteract this, by taking some strong and important pack marks. It wasn’t enough and Ireland scored a crucial goal to put them in front by a point. The Swans tried to respond, but Ireland were just to good as they continued to apply relentless pressure. 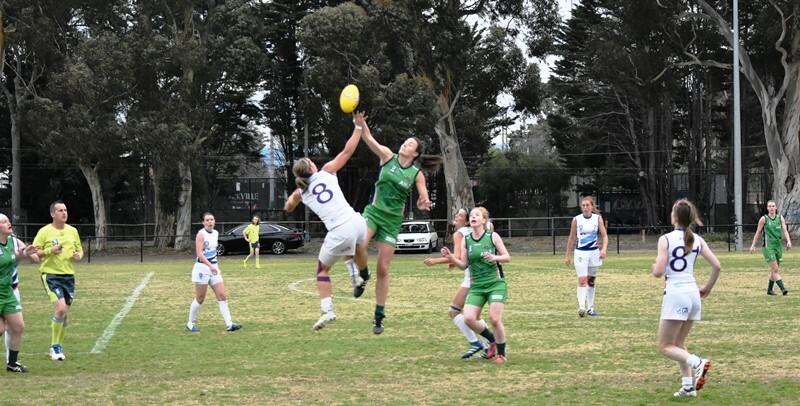 The Banshees consistently moved the ball forward and created opportunities, and when the ball fell to #23 Gillian Behan, she kicked an absolute crazy goal from the boundary line to put her team out of reach. The sound of the Irish crowd cheering for the girls was fantastic to hear as they all knew it was their game to loose from this point. Great Britain didn’t give up and kept trying to push the ball forward but Irelands #18 Marie Keating seemed to be everywhere on the field, taking some incredible marks completing some smart distribution. The final siren went and Ireland had won with the final scored ending at Ireland 3.5. (23), to Great Britain 2.3.(15). 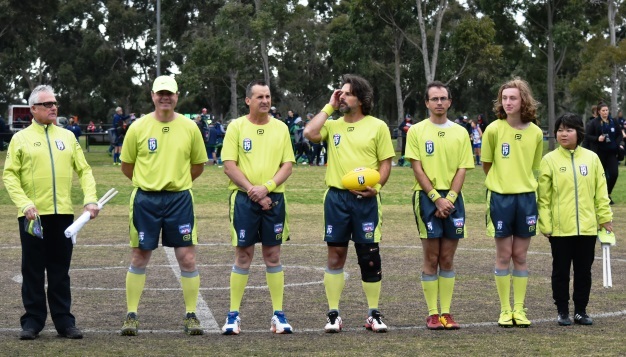 It was a great game that was well played by both sides and kept the crowd excited until the final siren. When Ireland started to be smarter and more clinical with their ball movement, Great Britain were unable to respond. It would have been good to see more overlapping runs made by #12 Carol Breen because when her teammates were able to find her she could completely burst out of a congested pack with her blinding pace to get the ball forward. She played well but if she was completely on form, she would have been unstoppable. #18 Marie Keating was influential in the Banshees victory and really changed the game in that last quarter. 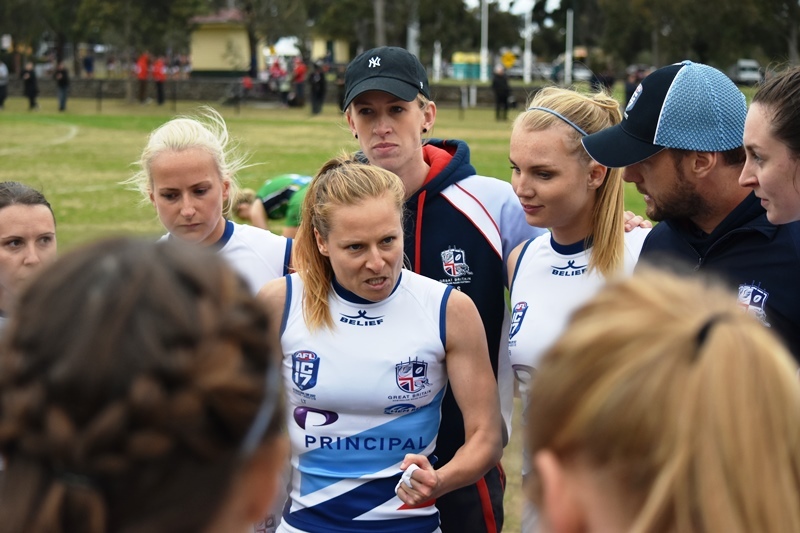 Her ability to speed up and slow down the speed of the game was evident and completely upset the momentum for the Swans. The Banshees could improve on switching the ball more to get it out of defense and using open spaces better but overall it was an impressive performance. Great Britain played well and can leave this game knowing they gave it their all. If they were more clinical with their scoring opportunities that they created, then it could have been a different outcome. The game was highly influenced by free kicks in midfield, so if the Swans avoided conceding some of these free kicks in areas, the outcome could have been a different story. The Swans are a tough team that really caused problems against an excellent Irish side and with a bit more improvement could become a dominant team.